As you probably know from my countless mentionings of this very phenomenon, I am graduating from college this Saturday. Like, six days from today. I will be donning the ol’ cap-n-gown, walking across a stage while my name is called, and flipping my tassel from right to left. I truly cannot believe this part of my life is complete. I’ve always been a student! I know not how to function as a non-student in today’s society. What do normal adults do? It’s crazy, man. Mad cray. I’ve found that I’m already starting to miss things. I’ll miss classes; I’ve always loved going to class and learning. I’ll miss friends; many of my friends are moving on to graduate school or jobs in different states. But most surprisingly, I’ll miss my professors. I’ve made some wonderful relationships with my professors, and I sincerely hope to keep in touch with many of them. One professor, in particular, has stood out to me as a cut above the rest. I owe so much to my capstone professor/the advisor for the student organization for which I was president, Dr. Pike. Dr. Pike is the kind of professor that made me excited to go to class, push myself, and strive to be my very best. She has taught me countless life lessons, all of which I will be taking with me to my big-girl job later this summer. She showed me what work ethic truly looks like, and that a strong work ethic is invaluable in any situation. She encourages me to do big things, and she even supports Fooduzzi (she bought me the bowls you see in this recipe, as well as some insanely delicious truffle products you shall be seeing soon). Dr. Pike is the best kind of mentor and friend, and I am so honored and thankful that she took me under her wing this year. Our organization had a dinner to transition new officers into their positions for the next school year a couple of weeks ago. Out of the goodness of her heart, Dr. Pike bought us all Chipotle catering. We reserved a room in one of the buildings on campus, and set up a burrito bowl feast, complete with all the fixins. Cilantro Lime Brown Rice? Check. Black and pinto beans? Check. All four salsas? Check. Cheese, sour cream, lettuce, and GUACAMOLE?! Check, check, check, & check! This very special dinner, along with Dr. Pike’s general awesomeness, inspired these crazy flavorful Homemade Burrito Bowls today; complete with flavorful whole foods, this Homemade Burrito Bowl recipe will make the perfect accompaniment to your Cinco de Mayo feast! I tried to stay true to Chipotle’s version with my Homemade Burrito Bowls, while still making it as simple and straight-forward as possible. I mean seriously, when a burrito bowl craving hits, you don’t want nothin’ standing in your way! My Cilantro Lime Brown Rice could not be easier to make. It truly is amazing how four simple ingredients can produce so much flavor: Nutty brown rice, tart lime, herbaceous cilantro, and salt to round out all the flavors. Pure whole food perfection. Oh, and these black beans! Guys! They’re bangin’. Take a can of black beans. Boil them with some good ol’ H2O until they get all nice and creamy. Add oregano, garlic, and your favorite hot sauce. Done. Simplistic deliciousness. The beautiful thing about these Homemade Burrito Bowls is that the toppings are completely up to you! They’re 100% customizable which makes them a perfect addition to a Cinco de Mayo partay. For my particular Homemade Burrito Bowl, I added some salsa (store-bought, but make your own if you’re feeling zany! ), avocado (swap this out with guacamole for a more traditional bowl), extra cilantro, extra lime, and some salt. 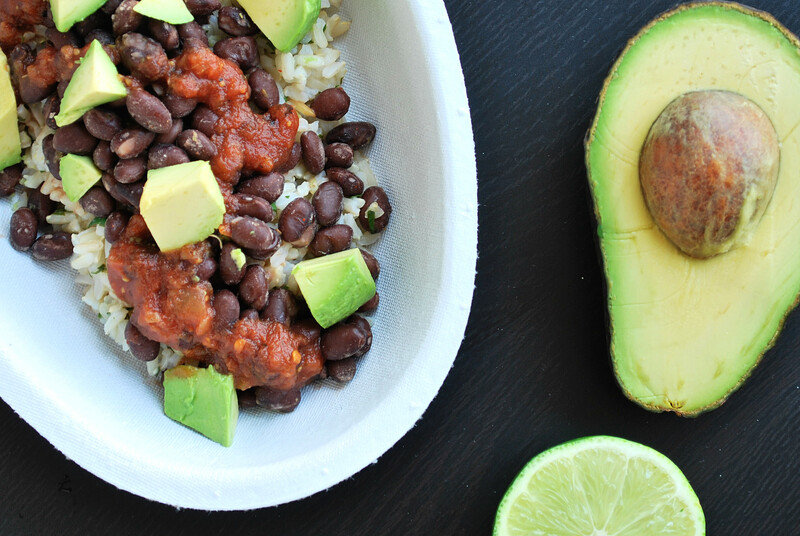 What will you put on your Homemade Burrito Bowl? The world is your oyster fiesta! I love how such a simple combination of textures and flavors can produce something as special as these Homemade Burrito Bowls. There is so much freshness at the forefront of these bowls, and the fact that everyone can DIY their own bowl? Could there BE a more crowd-pleasing Cinco de Mayo recipe?! So break out those margaritas, people; it’s Homemade Burrito Bowl time. 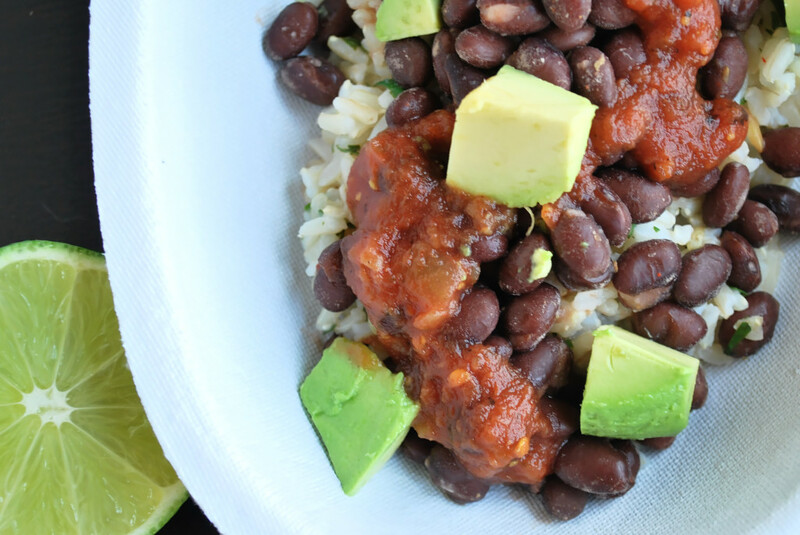 Gear up for Cinco de Mayo with these vegan and gluten free Homemade Burrito Bowls! They're completely customizable for a perfect DIY bowl! Make the Cilantro Lime Brown Rice: Cook brown rice in water according to package instructions. When all of the water is absorbed and the rice is tender, add the juice of half the lime and the 2-3 Tbsp. minced cilantro. Mix to combine, and add salt to taste. Set aside. Make the Black Beans: When the rice has about 10 minutes left, add drained and rinsed black beans to a small pot. Add 1/4 cup water and garlic and cook over medium-high heat until most of the liquid has been absorbed and the beans are nice and creamy. Add oregano and hot sauce. Mix to combine, and add salt to taste. Set aside. 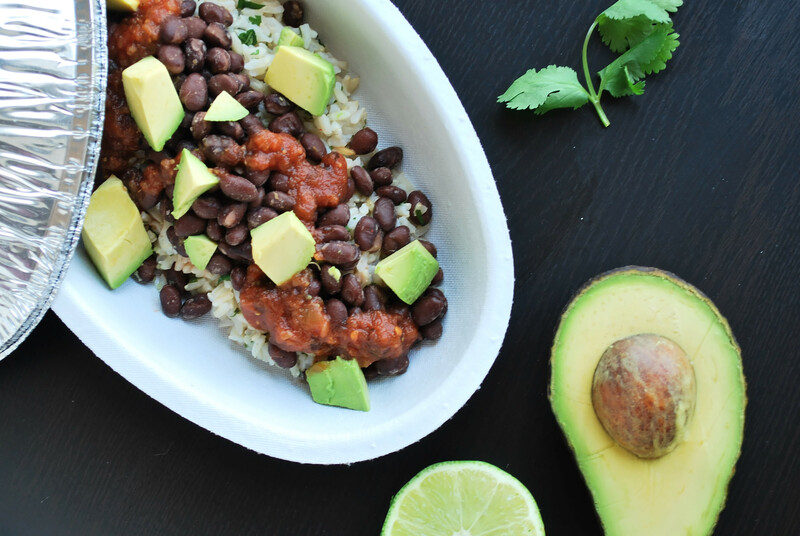 Assemble your Homemade Burrito Bowl: Divide rice between two bowls. Add black beans on top. Top with salsa, avocado/guacamole, and any other optional ingredients your heart desires. Thank you so much, Liz! I cannot wait! Graduation will be such a weird and surreal moment, but I’m sure it’ll be one of the most exciting of my life! Yummo!! And congratulations! And good luck! Duquesne will surely miss you:). Thank you so much! And thank you for everything – you are one of my all-time favorite teachers/professors!